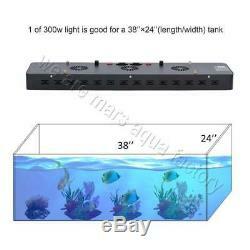 Mars Aqua 300W LED Aquarium Light for Coral Reef SPS LPS Marine Tank. Good for 38''×24'' tank. Lighting Recommendation (Hanging 12-16'' above water). Suitable for 38''×24'' Long Tank. Suitable for 76'' ×24'' Long Tank. Suitable for 72'' ×38'' Long Tank. Suitable for 96''×38'' Long Tank. 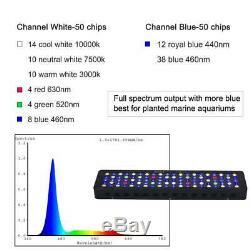 Specifications of Mars Aqua 300W LED Aquarium Light. 56 par for secondary lens can output more par. 1 of 300w unit is suitable for a 38''×24''(96×60cm) tank. 31'' × 7'' × 2''=80 19 6cm. 36'' × 10'' × 6''=902514cm. Warehouse in US, Canada, Germany, UK, AU. 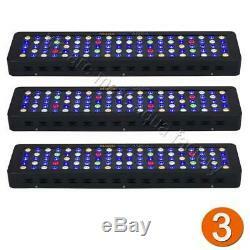 3 x 300W led aquarium lights. 6 x Free power cords. 3 x Set steel hanging kits. 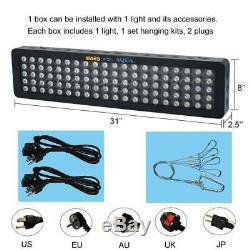 This listing is for 3pcs 300W lights. Each light comes with 2 plugs and 1 set hangings kits. 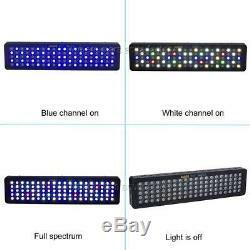 Features of 300W Led Aquarium Light. We use high quality materials to ensure the superb quality of our lamps. When both on/off switches and rotary knobs are on, the light is in full spectrum. 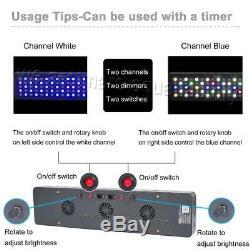 Turn the rotary knob, you can adjust the light intensity in your tank, simulating the natural environment such as sunset, sunrise, day and night, etc. 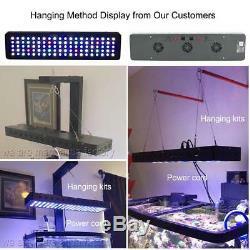 We have been manufacturing led aquarium light since 2009. We mainly do retail business, and that's why you see the price is very low compared with our competition. Low-noise fan with dual-bearing blade and high rotating speed to offer effective cooling. UL certification wires inside the panel. You may check numbers on the wires with that on UL website. Mars Aqua obtains the very professional spectrum that is best for growth of coral, reef, SPS, LPS, fish, etc. 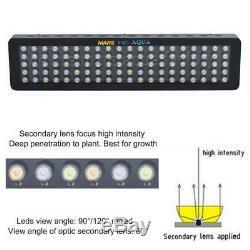 Mars lights are suitable for aquatic animals and plants, marine tank, saltwater tank, planted tank, etc. Worldwide warehouse and local repair center in US/Canada/EU/UK/AU. Mars Aqua is able to offer first-rate repair service for worldwide growers. If you don't need the item any more, please inform us within 7 days so that we can take action within time. Our buyers will enjoy a 30-day return of goods without any reason. Please share your personal experience and thoughts with Mars products by placing feedback or us. Tell us what impressed you as a user, and what improvements we can make in the future. We believe that good communication can solve all problems. 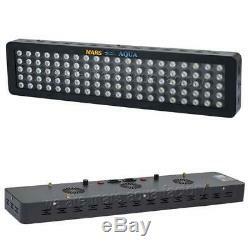 Mars Aqua 300W LED Aquarium Light. 14 cool white 10000k, 10 neutral white 7500k, 10 warm white 3000k, 4 red 630nm, 4 green 520nm, 8 blue 460nm. Amp: 1.61A/110v; 0.85/220v. Lumen: 8346 lumen /110v; 8318 lumen /220v. Decibel of the light: About 58.9DB. Par: 56 par for secondary lens can output more par. Recommend for: 1 of 300w unit is suitable for a 38''×24''(96×60cm) tank. Product Dimension: 31''×7''×2''=80196cm. Package Dimension: 36''×10''×6''=902514cm. Net Weight: 6KG /13 lbs. Gross Weight: 7KG /15 lbs. View Angle of LEDs:90/120° Mixed. When both on/off switches and rotary knobs on, the light in full spectrum. Turn the rotary knob, you can adjust the light intensity in your tank, simulating the nature enviroment such as sunset, sunrise, day and night, etc. 3 x Mars Aqua 300W aquarium lights. 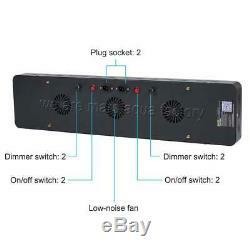 Shady sellers list their lights as 180W/360, please do not be misled by that since actual watt is the most important. You can input the numbers on the wires on UL website for check. The professional spectrum for growth of coral, reef, SPS, LPS, fish, etc. 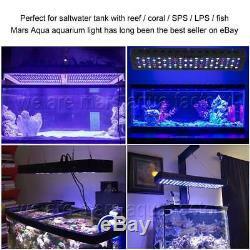 Suitable for aquatic animals and plants, marine tank, saltwater tank, planted tank, ect. The item "3PCS MarsAqua Dimmable 300W LED Aquarium Light Full Spectrum Reef Coral SPS LPS" is in sale since Tuesday, August 28, 2018. 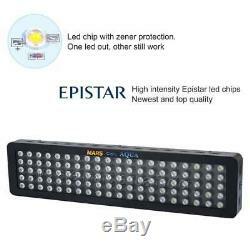 This item is in the category "Pet Supplies\Fish & Aquariums\Lighting & Bulbs".